Driving back to the hotel after dinner Saturday night I very much wanted to be able to take a moment and write each of you a thank you note. My traveling companion, however, saw to it that the opportunity to reflect on this year’s Big Summer Potluck did not come until the ride home on Sunday. And maybe that’s for the best. It allowed some time for the meaning of the weekend to reveal itself a bit more fully. Having attended two previous Big Summer Potlucks, I can attest that each one is unique; what I take away is going to differ each time. And while every BSP has it’s own personality there are common threads that run through each event. It is obvious that you put a great deal of thought into creating something that is fresh and new through the choice of speakers and topics. From Shauna talking about having the courage to ignore the negative editor in our heads, to Alice embodying the power of authenticity, to Joe and Jeni and Jessamyn speaking about allowing a vision to change, you offer us the opportunity to nourish a different part of our spirit every year. At the same time you manage to keep each BSP feeling comfortable and familiar by fostering a sense of community among a pretty varied group of attendees. Regardless of whether we are seasoned veterans, brand new bloggers, or if we’ve stepped away from actively blogging, we are a valued member of the BSP family. We are each greeted with a warm smile, an open heart, and an embrace. You allow each of us to (literally) be a guest in your home. Knowing the power that comes from sharing a meal together, you cook for us and allow us to contribute our own dishes to the group. It really is a potluck. There is no one BSP attendee experience. For the introverts among us, it is possible to hang back a bit and observe. And for those of us who are more outgoing, the opportunity to meet and greet and network with other bloggers and the brands we love happens organically…on the bus, at a meal, or during Open Mic time. Some years those discussions lead to tears…big, mascara smearing, salty sobs of realization and understanding. Other years, the epiphanies are private. In some ways I feel my BSP experience has come full circle. It was while I was at BSP 2011 that my mother passed away. The Universe saw to it that I was surrounded by a community of friends at a moment when my emotions battled and raged within me. I was not alone when one chapter of my life was so abruptly shut. At BSP 2013 I was able to introduce my BSP family to the newly opened chapter of my life…Miss Libby. Is it a coincidence that my daughter was born almost exactly one year after my mother died? I don’t think so. Bringing Libby to BSP this year felt like coming home. To everything there is a season. For me, BSP is the season of new beginnings. Those beginnings can be big and life changing. Or they can be quiet opportunities to recommit to myself. That may not be what you set out to achieve when you plan each year’s event. But somehow that is what you create. I’m already looking forward to BSP 2014. What a beautiful letter, friend. I am glad that 2012 and 2013 have brought so many positive things to you. I’m also grateful that we were together in 2011 so that I could hug you and hold you in my heart when you needed it. Amber, you are making me teary.� Much love to you my friend. What a beautiful letter and a touching recap to end a lovely weekend. Thanks for sharing your ‘thank you note’ to Pam, Maggy, Erika. They did a fantastic job! 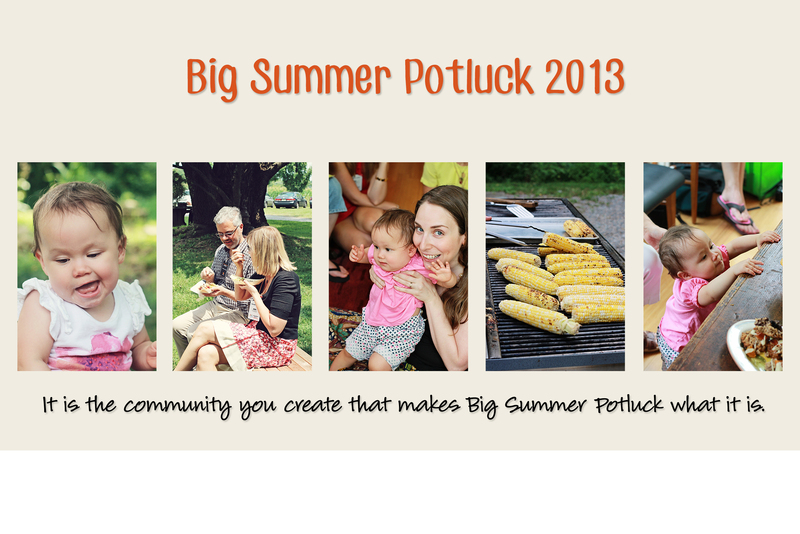 Here’s to many more ‘Big Summer Potlucks’ ! Thanks Betty Ann. BSP can be a hard to describe since it really is something different for each of us. Beautiful. I am forever grateful to BSP for meeting friends like you. I have BSP to thank for introducing me to some truly wonderful people too! Beautiful Wendi! It was fantastic to see you and celebrate in the joy and beauty that is Libby as well as you as a mama! You looked wonderful and I couldn’t be happier for you! I am just catching up on reading (oh, a few weeks late! )… Your post captures the spirit of BSP better than anyone’s I have ever read. It’s lovely. And, I’m so glad I got to see you and catch up this year. It was amazing to meet Miss Libby! Jen, you’ve been there since the very first BSP too. Who would have thought that spending a single afternoon together would spark such strong bonds and kept us coming back year after year? I’m truly grateful to be part of this magic. Your post gave me goosebumps, Wendi. I was so happy to see you at BSP this year and meet that gorgeous daughter of yours. Elizabeth, it felt good to be back among my BSP family…and to see how it has grown.